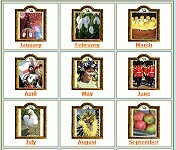 I have created several calendars for different events, special days, national holidays, festivals and celebrations which take place in the UK. Contains a brief description on what each event is about with links to more detail descriptions. 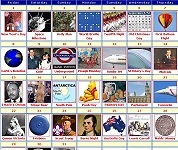 This is a month by month list of all the special days we have in Britain. 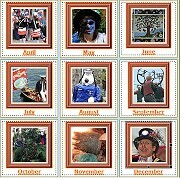 Facts, Folklore, Superstitions, Festivals and Special Days for each month of the Year. Includes an list of anniversaries for each month. Many charities and other organisations have special days and weeks like 'The Big Hush' or Children in Need. Find out what event is happening this month/year and when. Britain is full of weird and wonderful events. Here you will find the strangest events happening in Britain throughout the year. Ideal for using in the classroom on interactive boards. Contains links to suitable pages for children/adults wanting to learn more about each event. Church Year of Christian Festivals. Many Christian Festival dates change each year. 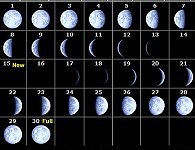 This page contains information on the different festivals. A colourful month by month list of all the main religious festivals. "As a childminder I like to celebrate festivals and awareness days with the little ones. This was the best and most comprehensive list I found on the net." 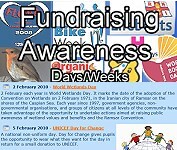 "Information about awareness days and special dates to help me plan my youth work programme." "I am British but now living in the US. I needed to know when Mothers' Day is in the UK. (In the USA it is always in May. In 2007 it is on May 13 this year. I didn't want my mother to think I had forgotten her - in March! Now she'll get two cards - one in March and one in May but she deserves to be applauded twice!" "This is a fantastic website. I am a headteacher planning this terms assemblies and came accross your site through REonline. It is full of useful well presented information. I can use a lot of it in my assemblies and I will be recommending that my staff use it with children. We are an infant school but the way you present the information is so accessible that I feel we could use it. Thank you."